“Mayans M.C.,” a spinoff of motorcycle gang saga “Sons of Anarchy,” tackles conflict along the U.S.-Mexico border amid poverty and a drug war. The FX Networks series stars J.D. Pardo and Edward James Olmos who lead a majority Latino cast that navigates the dark world of motorcycle gangs and tensions from immigration, cartel violence and race. 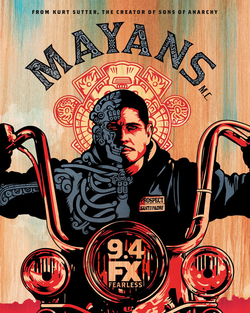 Pardo plays Ezekiel “EZ” Reyes, a fresh-out-of-prison “prospect” for a chapter of the Mexican-American Mayans M.C. in Southern California. But he must come to terms with his former life as a one-time promising Stanford University student who now has turned to a world of crime and Mexican cartels. “Sons of Anarchy” creator Kurt Sutter says he tapped Boston-born, multiracial filmmaker Elgin James to give the show a distinct voice and storyline focusing on Latinos.